Even Lewis himself amid his Saturday beam sounded perhaps a note of caution, outlining that rather incongruous with the long straights overtaking is actually very difficult at Monza. "For some reason you need to have a delta of nearly a second [per lap] advantage to the car in front to be able to really put the overtaking move into action" he mused. In other words, if he did lose places off the line then even with his inherent pace he could be in for a long day. Turns out we're all good mystics. This in the event is almost precisely what happened. Or perhaps it all didn't require that much foresight, as what we got was almost precisely as in the Hockenheim weekend two rounds prior to this one, except with the Merc drivers' names swapped around. Perhaps yin and yang was at play again. Lewis's start was indeed a stinker and he immediately was swallowed left, right and centre by opponents, leaving him in sixth place exiting the first chicane. "I'm told it wasn't a driver error, but it wasn't anyone's error" said Lewis later. "It's just we continue to have an inconsistency with our clutch. "I was told the procedure was exactly how we're supposed to do it, but unfortunately we just had over-delivery of torque and the wheels were spinning from the get-go...We've seen it with Nico in Hockenheim; it's hit me quite a lot this year...We have made improvements, so we have seen more consistent better starts, but we are still caught out by the random variation that we have from one weekend to another. "We've been dominant all weekend and when it's like a tenth of a second or something that decided the race, for sure that's tough for everyone." Nico's start however while not dazzling was decent enough to take the lead, holding off - just - the as-ever fast starting Ferrari pair on the second row. Vettel did his best to make things interesting in the first couple of chicanes, but knew after those, when still behind, that he'd have to give best to the silver machine. And Nico confirmed afterwards what most on the outside sensed - that these few seconds after the red light went out contained most of the battle being won. "The start was the big opportunity," he said afterwards. "That worked out fantastically, because we had the soft [tyre compound] and the Ferraris had the supersoft, so they had a bit more grip. But it worked out great. "That gave me the race win in the end, because from then on I was able to control the pace, at a good speed." Just as in Germany the apparently pre-programmed course of the weekend was shifted markedly to another resolute course, within a few seconds of the race starting. Lewis didn't give up quite that easily, and indeed cleared Daniel Ricciardo in short order to claim fifth. 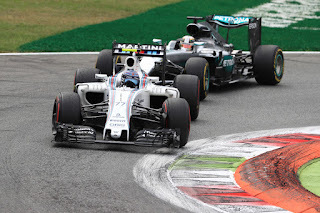 But then came the crucial part, as he spent near enough ten laps behind Valtteri Bottas's Williams, which was trimmed for speed and therefore was one of the swiftest out there in a straight line. By the time he made it by - and even though with the Ferrari pair ahead stopping twice to the Mercs' once he'd be able to clear them with no rancour, giving him a clear run in effect at his team mate - he was 12 seconds off Nico's lead and knew the game was a bogey. Indeed even in clear air the gap stretched out a bit further, peaking at 15 seconds by the time of their sole pit stops, presumably a consequence of the strain on Lewis's tyres from being in Bottas's wake. "If I was eight seconds behind from the beginning then I would have closed the gap," said Lewis, "then I would put some pressure on and maybe been in a better position, but 15 seconds, it's a long long way to come back with the tyres we have today." Lewis's pace advantage of qualifying was seen but rarely in the race, only in the odd charge, but him getting even close to Nico never looked likely. More broadly the gap hovered, was trimmed incrementally perhaps, but stayed mainly as it was. Indeed by the end it had drifted back out to 15 seconds. Either Merc had their own individual explanation for this. Nico reckoned that for all of Lewis's single-lap pomp this weekend on race pace there in fact was little between them. "When we were practicing for the race on Friday I was looking really strong," he said. "I felt really good. I knew I had a chance to push Lewis in the race whether he was in front or behind me, that I had a chance to win. I confirmed that today of course. 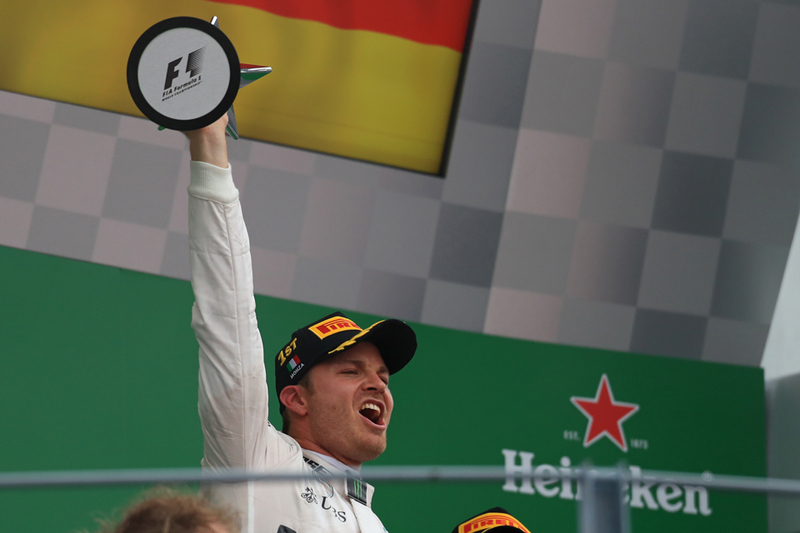 "An F1 race is never straightforward" Nico insisted of his latest dominate-from-the-front win, "the first stint was OK with the Ferraris, but I still need to keep the pace up and do everything like that, so it's never easy." But then he got a bit closer to the essentials, "but yes it's not the toughest race I've had". 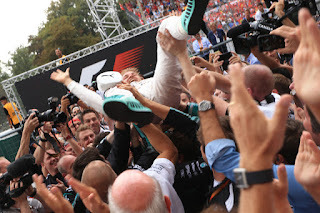 And indeed in fairness to Nico he stroked out the win magnificently in that way we know he can. And while as outlined Lewis agreed that the game was up early, his interpretation of the reasons why differed from that of his stable mate. Instead he nodded accusingly in the direction of the pariah limited-resource Pirelli tyres. 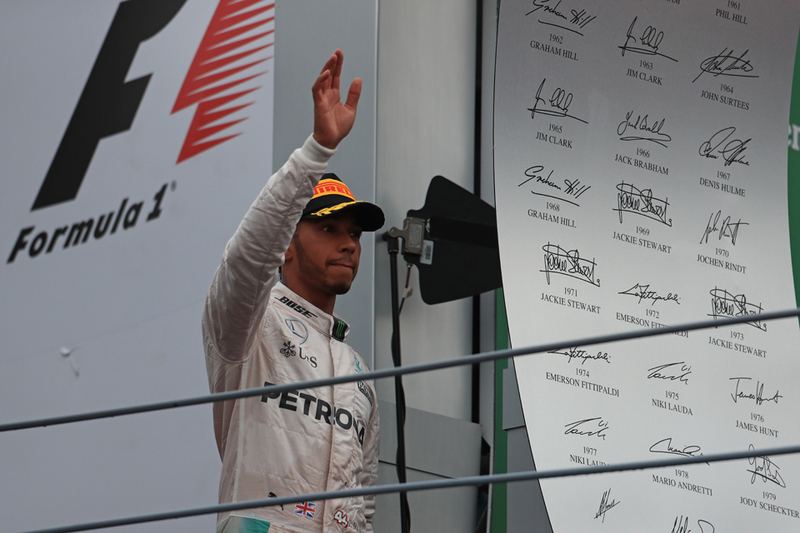 "It [the gap] was 15 seconds at one point and I brought it down to like ten or nine or something like that” said Lewis. "Unfortunately that's too big a gap to close with the tyres that we have, the performance, and I had to make it to the end of the race. It soon became not a race with Nico, it became a race with the guys behind to make sure we didn't lose any more points. "I could have kept going at the pace I was going, I could have brought the gap down to maybe six [seconds], but it's still not enough to win the race. To close a 15 second gap, which you're going to have to go 3-4 tenths of a second quicker per lap probably over that span of time, you're not going to have any tyres left at the end. "I might have [caught Nico], I might not have? But sure if I'd ever closed the gap I wouldn't have had tyres to get past at least." When asked what he thought about that situation, his answer was just about constrained. “It's not like Christmas Day, when you're happy. "If we had better grip and I could push [like a] qualifying lap every lap, that would be awesome, but that's not the case. It's not been the case for a long time." 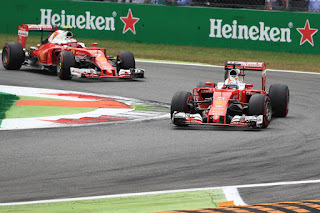 The Ferraris all weekend had been a very comfortable, you might even say lonely, best of the rest, and that indeed is where they ended up in the race, Vettel coming home third around six seconds behind Lewis and roughly the same margin ahead of team mate Kimi Raikkonen. It still felt slightly underwhelming, as the apparent improvement at least owed something to the local track specifics. And as intimated the red pair wasn't even really the most minor of irritants to the Mercs. Still Vettel and his boss Maurizio Arrivabene insisted after Ferrari's home gig that things now are moving in the right direction for the Scuderia. "One month ago we took our action [a restructure of the team that included the departure of technical director James Allison]" said Arrivabene later, "and now in the last two races things are going a bit better, the atmosphere in the team is positive and everybody is looking forward to race after race this year and for next year." Reflecting recent disappointments, Vettel mused also that "I think we extracted our best race which obviously, y'know… it's been a while since that's been the case". The Monza track could have been designed to show up the Red Bulls and as expected they weren't anything like the factor in this one that they had been in preceding rounds. 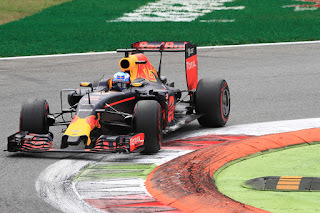 Ricciardo however as usual made the best of things and provided some fireworks in doing it. His pass of Bottas late on, out-braking him into the first chicane from what seemed a mile back, is something that will live long in our memories. "I was pretty jacked up after the move" said Ricciardo later with justification. It nabbed him fifth place which he kept to the end. 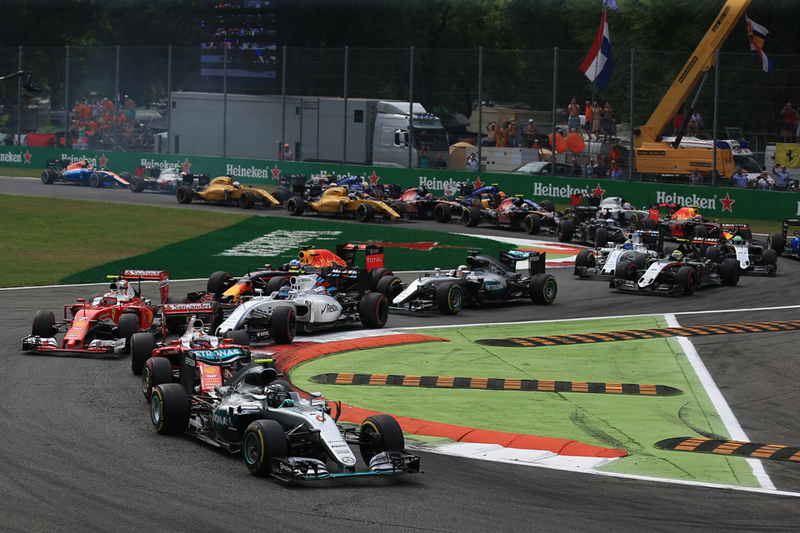 Max Verstappen had a quiet day for once and finished seventh. One expects both he and Ricciardo will be back right at the sharp end in Singapore, indeed Danny Ric promised as much. But at the sharp end of the world championship standings another unexpected outcome of the Monza race is that a real drivers' title fight has somehow sneaked up on us all. Nico's points deficit to Lewis is now a scant two. Or nothing to tell. To think also that before this one - and for weeks - we were convinced that was a foregone conclusion in Lewis's favour too.